2017 was another bumper year for celebrity superyacht vacations with sports stars, models, actors and the like all opting for some of the world's largest yachts for vacations around the world. Click through to see which stars were spotted on board this year and which vessels they chose to charter... Joan Smalls and Anja Rubik Puerto Rican model Joan Smalls joined her Polish colleague Anja Rubik on board superyacht Ecstasea in the Bahamas in February 2017. The pair took a short vacation in the tropical yachting hotspot to relax before the start of fashion month and made full use of the yacht's extensive facilities, unwinding on her sunpads, zipping around the ocean on her Jet Skis and, in Smalls case, even taking a turn at the helm. Puerto Rican model Joan Smalls joined her Polish colleague Anja Rubik on board superyacht Ecstasea in the Bahamas in February 2017. The pair took a short vacation in the tropical yachting hotspot to relax before the start of fashion month and made full use of the yacht's extensive facilities, unwinding on her sunpads, zipping around the ocean on her Jet Skis and, in Smalls case, even taking a turn at the helm. Supermodel best friends Kendall Jenner (left) and Bella Hadid (right) took some time off in May 2017 to enjoy a luxury yacht vacation in a secret tropical destination. The girls were joined by fellow famous friend Hailey Baldwin and posted a series of snaps to social media from both the yacht and its Jet Skis, one of which Jenner captioned 'You won't find me', referencing their decision to keep their enviable destination under wraps. Canadian model Winnie Harlow was just one of many celebrities spotted on yachts during the Monaco Grand Prix in May 2017. The star attended the event after spending a few days at the Cannes Film Festival and chose 81 metre Oceanco Alfa Nero for her Mediterranean charter vacation - being sure to show off its top superyacht pool on social media. Canadian model Winnie Harlow was just one of many celebrities spotted on yachts during the Monaco Grand Prix in May 2017. The star attended the event after spending a few days at the Cannes Film Festival and chose 81 metre OceancoAlfa Nero for her Mediterranean charter vacation - being sure to show off its top superyacht pool on social media. Supermodel turned beauty entrepreneur Cindy Crawford showed her adventurous side when she shared this snap from a vacation on board Aria Amazon - one of the best yachts available for charter in remote destinations. As the name suggests, the yacht cruises the waters of the Peruvian Amazon and Crawford and her family made the most of everything the trip had to offer, sharing posts of traditional dancers, sunset cruises on the yacht's day boat and anaconda spotting from a tender. How better to spend your honeymoon than on board a superyacht in Italy? Victoria Swarovski, Austrian singer and heiress to the world-famous crystal brand, shared this snap on board 26 metre Sanlorenzo White Star II in June 2017 just days after marrying Werner Mürz at a lavish ceremony in Portopiccolo. The couple went on to visit a number of Sardinia's yachting hotspots during their honeymoon. How better to spend your honeymoon than on board a superyacht in Italy? Victoria Swarovski, Austrian singer and heiress to the world-famous crystal brand, shared this snap on board 26 metre SanlorenzoWhite Star II in June 2017 just days after marrying Werner Mürz at a lavish ceremony in Portopiccolo. The couple went on to visit a number of Sardinia's yachting hotspots during their honeymoon. Sean Combs, AKA Puff Daddy, shared a number of insider pictures from his vacation on board 65 metre Codecasa superyacht Double Down in July 2017. 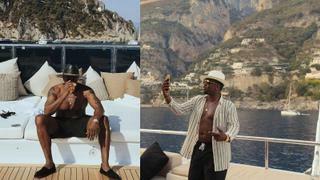 The star was staying on board the yacht, which is currently listed for sale and charter through Thompson, Westwood and White, on the Italian Riviera and, as well as enjoying the yacht's first class facilities, found it to be an excellent location for a number of business activities including promoting his new single Watcha Gon Do and filming a commercial for his tequila brand DeLeón. Hollywood star Reese Witherspoon combined work with pleasure when she was spotted on board 51 metre Codecasa yacht Emelina during a party thrown by luxury fashion brand Haney in July 2017. The yacht, which is owned by the family of fashion designer Mary Alice Haney (pictured left with Witherspoon), cruised around picturesque Sag Harbor in the Hamptons while guests enjoyed dinner and drinks on its elegant top deck. Victoria's Secret model Taylor Hill was spotted enjoying a luxury yacht vacation on the French Riviera in July 2017. The American model was joined by friends, including boyfriend Michael Stephen Shank and fellow model Daphne Groeneveld, on board 44.65 metre Feadship superyacht Harle in Saint-Tropez. The group spent time enjoying the yacht's top deck sunbathing area and jumping off the side into the ocean before heading ashore for an afternoon at the famous Club 55. American actress Eva Longoria shared this snap from a luxury yacht vacation in Mallorca in July 2017. Longoria was joined by her husband Jose Antonio Baston on board VIP One and the pair made good use of the yacht's swim platform before heading ashore to check out the highlights of yachting hotspot Palma. Longoria was also spotted ringing in the New Year in style on board a luxury yacht in Mexico in 2017. Longoria took an extended vacation in Acapulco over the Christmas holidays and used her yacht to explore the surrounding coastline, as well as heading on shore to indulge at some of the best hotels and spas in the Americas. American actress Eva Longoria shared this snap from a luxury yacht vacation in Mallorca in July 2017. Longoria was joined by her husband Jose Antonio Baston on board VIP One and the pair made good use of the yacht's swim platform before heading ashore to check out the highlights of yachting hotspot Palma. Longoria was also spotted ringing in the New Year in style on board a luxury yacht in Mexico in 2017. Longoria took an extended vacation in Acapulco over the Christmas holidays and used her yacht to explore the surrounding coastline, as well as heading on shore to indulge at some of the best hotels and spas in the Americas. 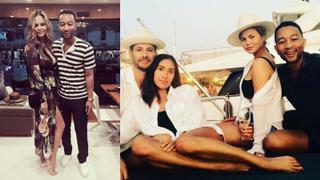 Celebrity power couple Chrissy Teigen and John Legend took time off from their busy filming and recording schedules to enjoy a luxury yacht vacation in Corsica in August 2017. The pair stayed on board 34.14 metre Italyachts Phoenician and were joined for part of the trip by celebrity hairstylist Jen Atkin and director Mike Rosenthal (above right). The group spent much of their time lounging on the yacht's aft bathing platform before heading ashore to discover the delights of the popular Mediterranean destination. Celebrity power couple Chrissy Teigen and John Legend took time off from their busy filming and recording schedules to enjoy a luxury yacht vacation in Corsica in August 2017. The pair stayed on board 34.14 metre ItalyachtsPhoenician and were joined for part of the trip by celebrity hairstylist Jen Atkin and director Mike Rosenthal (above right). The group spent much of their time lounging on the yacht's aft bathing platform before heading ashore to discover the delights of the popular Mediterranean destination. When you spend the entire summer DJ-ing some of Ibiza's hottest parties it would be remiss not to enjoy some downtime on the numerous superyachts that arrive in the area each season. 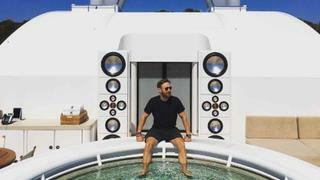 French DJ David Guetta shared this stylish snap highlighting the impressive speaker system on board 71.7 metre superyacht Kogo from a jaunt on board in August 2017 - undoubtedly proving it to be one of the best party boats around. 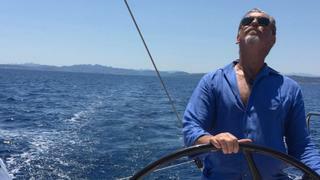 Irish actor Pierce Brosnan shared this action shot from a recent luxury yacht vacation in Italy. Brosnan was joined by his wife Keely Shay Smith and the couple began their vacation on board 20 metre Ferretti yacht d'Artagnan before switching to sailing yacht Solaris (pictured) which Brosnan himself sailed to Corsica.